Cyndi Lunsford (top left) in Swampoodle, J.G. McMillan (top right) in West Passyunk, Michael McCarty (bottom left) in Devil’s Pocket, and Lisa-Jane Erwin (bottom right) in East Oak Lane. The Inquirer and Daily News explained last month how we define neighborhoods in Philadelphia and asked for your feedback. Like true Philadelphians, you gave us plenty. Some of you said our names and boundaries were right; others said we were way off. Southwest Center City: Residents overwhelmingly said they call this area Graduate Hospital. Oak Lane: Some people said they live in East or West Oak Lane, not "Oak Lane." Others questioned why our map lists "Midwest Oak Lane." Center City: People pointed out this is a large geographic area with sections that have names of their own, including the Gayborhood, Washington Square West, Rittenhouse Square, and Logan Square. Our map does not list those subsets of Center City. South Philadelphia: Residents asked why we don't identify smaller areas such as East Passyunk, Newbold, and Girard Estates as neighborhoods. Kensington: Some people insisted they live in Fishtown, while others said Olde Kensington. Bustleton: Some said they call this area Pine Valley. How people decided what to call their neighborhoods varied greatly. Some relied on Google Maps or civic associations, while others referenced the names used by parents; neighbors; or nearby landmarks such as schools, parks, and shopping malls. A few simply declared: "That's what it's called." We reached out to people across the city who gave us feedback. 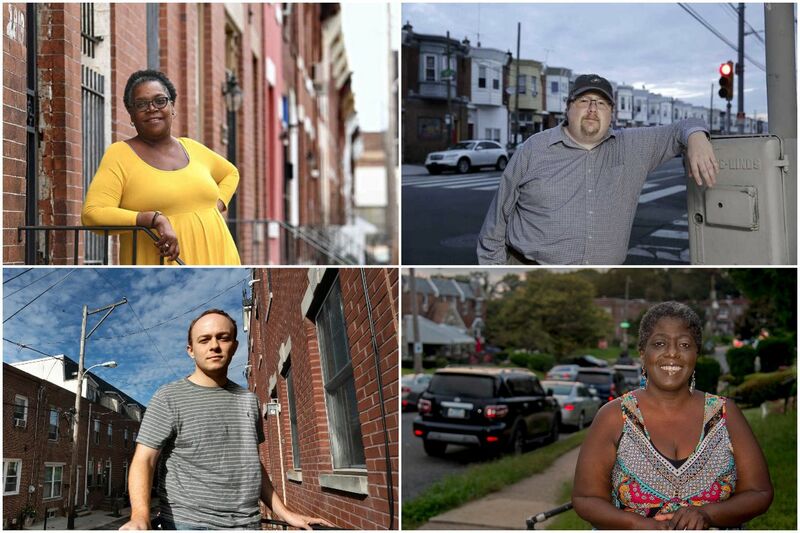 Here's what some of them call their neighborhoods — and why. Cyndi Lunsford stands along North Opal Street, where her family moved in the 1950s. Cyndi Lunsford's parents bought the house that is now hers in 1959 for less than $6,000, using her father's G.I. Bill money. They were the second black family on the mostly white and Jewish block, she said. The demographics changed over time, but Lunsford remembers that everybody called it Swampoodle. "That's what it's always been called," said Lunsford, 55. "I don't know what else to think. If somebody says, 'Where is that,' then I'll tell them it's around 20th and Lehigh." Lunsford acknowledged the name today is mostly "a nostalgia thing." Younger generations tend to use Allegheny West or North Philadelphia, though there have been efforts to revive the Swampoodle name. How the neighborhood got its name isn't exactly clear. Some have said the area was known for being swampy before it was developed. More recently, it's where a parking lot was briefly transformed into a beach this summer, before the landlord shut it down. Lunsford wants a historical marker placed in the area so people don't forget its name. "It's sad that they're just trying to make it all generic like Allegheny West," Lunsford said. Swampoodle, she said, "makes you remember. It's just unusual." Dana Goodman knows some people call the area where he grew up Tioga. Others even call it "Tioga Nicetown." "Tioga Nicetown is fine as long as the Nicetown is in there," he said, "because that's what it is." He added, laughing, "I'll concede that much." Goodman, 48, grew up along the 1200 block of West Russell Street, near Temple University Hospital. He now lives in Drexel Hill, but his family still owns the house on Russell. A neighborhood name is more than just a title, he said: "It identifies who you are as a person." Michael McCarty on his block in Devil’s Pocket. Michael McCarty moved to Philadelphia in July from New York City and lives on a small stretch of Catharine Street just outside the Naval Square gated community. "I've been calling the area Devil's Pocket because that's what Google Maps labels it," said McCarty, 26. The Inquirer's map identifies his area as "Schuylkill," but he's never heard anyone call it that. Then again, most Philly transplants he's spoken to haven't heard of Devil's Pocket, either. He sometimes tells people he lives in Graduate Hospital, but that doesn't quite fit, he said. Other times he explains where he lives in relation to more well-known locations, saying, for example, "a 20-minute walk south of Rittenhouse Square." The origin of the name Devil's Pocket is unique: Apparently a priest considered the kids who lived in the area so tough that they'd steal a chain from the devil's pocket when they reached hell. No word on whether that actually happened. Rich Quodomine in his neighborhood. Rich Quodomine says his neighborhood stands out. It doesn't have the drug corners that plague parts of Kensington (the neighborhood that the Inquirer's map says he lives in). And it doesn't have the hipster, gentrified vibe of Fishtown, where construction is booming. "It's just a very distinct feeling," he said. "So that's why I think a lot of people are calling this area Olde Richmond." Quodomine, 44, moved to Olde Richmond from upstate New York in 2017 to take a job with the City of Philadelphia. He wanted a neighborhood where his children could feel safe walking at night, and he liked the area's calm, family-oriented vibe, he said. "It looks pretty good, so the people have stayed here," he said. "They've kept the places up." Lisa-Jane Erwin on her block in East Oak Lane. Lisa-Jane Erwin moved to the area 16 years ago and learned its name from a neighbor. East Oak Lane makes sense, she said: It's east of Broad Street, and West Oak Lane is west of Broad. "When I said I lived in East Oak Lane, nobody ever said, 'Where is that?'" said Erwin, 57. "People were able to identify with that particular title." There's still debate on what constitutes just "Oak Lane." And the Inquirer's map even has another designation for a small section west of Broad: "Midwest Oak Lane." Erwin knows neighborhood titles can differ from person to person. She grew up in an area that the Inquirer's map identifies as Hartranft and attended Hartranft Elementary School. But she never called the area that. "It was just North Philadelphia," she said. As the city continues to gentrify and attract new people, Erwin questions what will happen to the traditional neighborhood names. "I wonder what [newer residents] rely upon," she said. "Is it just what the Realtor tells them?" Rebecca Lopez Kriss with her daughter, Verbena Stanley, 3, and husband, Nicholas Stanley. No, it's not just "Center City," Rebecca Lopez Kriss says. "Center City is big geographically, so it's helpful to say a little bit more: 'Oh that's over in Wash West. That's over in Old City,'" she said. Lopez Kriss, 38, and her husband, Nicholas Stanley, 40, moved to Philadelphia from Michigan in 2011 and moved to Washington Square West in 2013. She considers her kid-friendly block a special place. "Living in Wash West feels a little bit like we've arrived in a way," she said. "We worked really, really hard. We moved to Philadelphia, because we fell in love with it as a city and somehow found a place here." Angela Reason on her block in Overbrook Park. Angela Reason first heard the name Overbrook Park while searching for houses before she moved there from Yeadon in 2006. Reason doesn't know exactly why it's called Overbrook Park, but she has a guess: It's surrounded on three sides by parks. (City Avenue borders it on the remaining side). The neighborhood, smaller than the neighboring "Overbrook," has a tight-knit vibe, she said. "For me it means community," said Reason, 49. She's a member of the Overbrook Park Civic Association. "I think because our boundaries are so distinct with the parks, we are able to come together more." J.G. McMillan at South 21st Street and Snyder Avenue. He calls the area West Passyunk. J.G. McMillan views his neighborhood as sandwiched between two areas, Point Breeze and Girard Estates, but with no claim to either. So he and the local neighborhood association use a different name: West Passyunk. "No one had really claimed it before," said McMillan, 37, who was previously secretary of the West Passyunk Neighbors Association. He considers West Passyunk's boundaries to be from 18th to 25th streets, and from Mifflin Street to Passyunk Avenue. Having a specific name, he said, helps residents and businesses identify with the area. "It's always important for people who live in a neighborhood or people who want to belong to a community to have some sort of geographic focus," McMillan said. "It's something that unites them all." News developer Jared Whalen contributed to this story.